Saturday, February 11, is National 2-1-1 Day, in recognition of the free, user-friendly phone number that serves 90 percent of America’s population, while connecting some 16 million people a year to critical resources, information, and services. 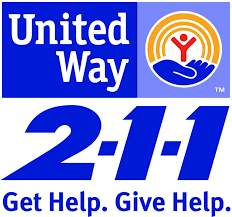 “In Van Wert County, hundreds of people turned to 2-1-1 for help last year,” said United Way of Van Wert County Executive Director Vicki Smith. People called to find information for meeting basic needs, like heating or utility assistance, emergency help, or to find the closest food bank. However, they also called for everyday information, to find out where to take their child for developmental screening, or how to locate job training or find free tax filing support. Ohio United Way has worked diligently to expand 2-1-1 service statewide; in Ohio, 68 of 88 counties now offer the service, with two more counties joining in 2017. This will give 94 percent of Ohioans access to much-needed social services. The 2-1-1 system does more than connect people with help; it also takes the “pulse” of American communities. Calls to 2-1-1 centers in many communities spiked before the recession in 2009, for example. In addition, in 2010 a national survey found many 2-1-1 centers were getting pleas for help from people who had never sought any help from food pantries or public assistance, or rent and utility assistance. Many communities analyze 2-1-1 data as one social indicator of local needs and economic stability. Van Wert County is no different. When 2-1-1 data indicated a major gap in transportation services for the area, United Way, along with community leaders and agencies, worked together to help fill the gap with new transportation services starting this month. So what happens with a 2-1-1 call? When someone dials 2-1-1 (free), the call transfers to the local 2-1-1 center, where callers speak with a trained information and referral specialist, who discerns their needs, then searches a comprehensive database of relevant human service referrals. The 2-1-1 specialist also explains how to access those services. In the case of a worker recently laid off or whose hours have been reduced, the 2-1-1 specialist may share information about unemployment benefits, job search options, food stamps, food pantries, mortgage or rent help, utility assistance, counseling, and other available resources. United Way has been long-standing supporter and the national leader of the 2-1-1 movement. As the largest private funder of the 2-1-1 network, United Way continues to strengthen and support 2-1-1 as another way to build stronger communities and create opportunities for all. For more information or to schedule a presentation for an organization or business, contact the United Way of Van Wert County at 419.238.6689 or email unitedway109@gmail.com.